I was fortunate to have presented again at the Reform Symposium – 3 days of free webinars given by teachers and educators from around the world. It was another great experience. 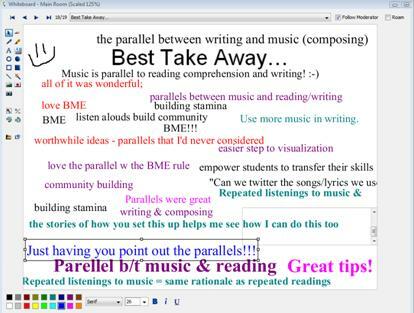 I presented on “Integrating Music with Literacy to Help Struggling Readers.” I find this topic very interesting and was so excited to share my insights with others. We had about 35 educators in attendance and what a great group! They were terrific at sharing ideas, and helping each other out. The overall feeling of our time together was a very positive one! 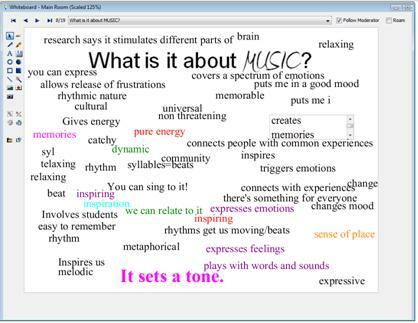 I wanted to take the time to share a few screen shots of the session with you to make a few points about the power music can have in any classroom. Here’s an image taken from the session when I polled the teachers on how they feel about music. As I suspected, no one admitted to not enjoying music. (Why else would they attend such as session, right?) But I found it interesting that a majority of those in attendance didn’t consider themselves musicians. To me, this just shows how you do not have to be a skilled musician to enjoy music and bring that enjoyment to the classroom. Then I asked what the teachers thought in terms of how their students felt about music. 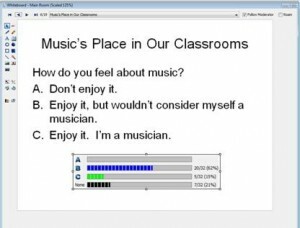 Overwhelmingly, they felt students enjoyed music a lot. So – this shows me that if we harness that enjoyment and turn it into motivation, what a powerful tool we have as teachers. AND couple that with the enjoyment so many teachers have with music. 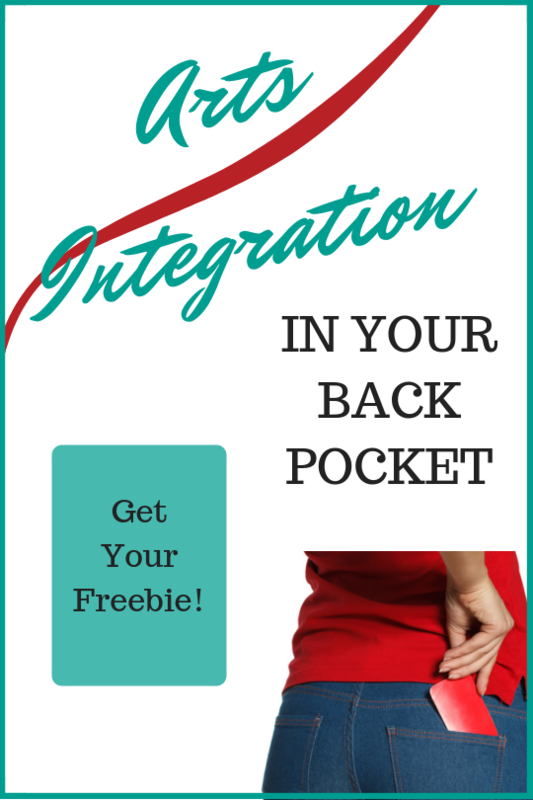 You have a tool that satisfies both teacher and student making them more invested in music integration. So what is it about music? Well, I could have rambled on and on about what I think and know is true about the power of music education and integration, but for this session, I put the question out to the participants and their list was terrific! Here is the whiteboard after everyone had a chance to add to it. This part of the session went so fast. 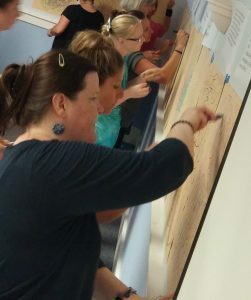 Everyone had so many ideas and contributions! I enjoyed my time very much and I could tell people were happy to have the opportunity to learn more about what music integration can do for their literacy programs. One participant, @aschordine, composed a post talking about her experience attending the webinar. It was great feedback for me to know that the concepts we discussed were inspiring and helpful. You can read Alicia’s post at her website With Wings to Fly.